Los Angeles - Pop culture is everywhere. It reflects the ideas, attitudes, and perspectives of the era, and has done so for decades. Van Eaton Galleries has announced its first joint popular culture and Disneyland auction: The Art of Entertainment, to take place at Van Eaton Galleries in Sherman Oaks, California on May 4th, 2019 beginning at 10:00 a.m. PT. On offer are 700 rare and extraordinary items, many of which are at auction for the first time. From original artwork to the memorabilia that defined our youth and shaped our world, The Art of Entertainment auction will celebrate important moments from television, film, Disney theme parks, and more. The vast array of art and memorabilia to be offered will surprise even the most avid collectors, with iconic moments immortalized by famous artists, designers, and artisans spanning from the early 1930s to today. Pop culture has defined our world. It’s that blend of ideas and objects which captures our attention and doesn’t let go, whether it be a mainstream favorite or a cult classic. The works which can claim the hearts of fans live on, continuing to shape popular culture well past their production date, and The Art of Entertainment collection captures the art and imagination which inspires such loyalty. Who can forget their fascination with the world’s original Superheroes: Superman, Batman, Wonder Woman, and Spider-Man? What about the laughter evoked when watching your favorite episode of “Happy Days” or reading comic strips featuring Charles Schulz’s lovable Charlie Brown? From Dr. Seuss’ “Cat in the Hat” to the whimsical magic of “Mary Poppins,” this extraordinary auction will commemorate the most nostalgic moments of our time. Rare items from Disneyland, award-winning television series, and favorite cartoons are just some of the items on offer. Highlights of “The Art of Entertainment” include a signed original Dr. Seuss “The Cat in the Hat” drawing (Estimate: $6,000-$9,000); an original Charles Schulz “Peanuts” comic strip (Estimate: $15,000-$20,000); a rare original “Superman” poster painting by Drew Struzan ($7,000-$9,000); a rare “Batman” Drew Struzan original poster painting (Estimate:$7,000-$9,000); a rare, large original painting created by renowned cartoonist Charles Addams for the 1976 feature film “Murder by Death” (Columbia 1976) - (Estimate: $30,000-$40,000); an extremely rare and complete “20,000 Leagues Under the Sea” exhibition campaign book ($1,500-$2,500); a “Spider-Man” original poster painting ($6,000-$8,000); a Collection of “Happy Days” slides and photos (Estimate: $100-$200); a 20th Century Fox large neon sign by famed neon sculpture artist Lili Lakich (Estimate: $5,000-$8,000); a “Wonder Woman” original poster painting (Estimate: $5,000-$7,000); and Walt Disney’s “20,000 Leagues Under the Sea” (Disney, 1954) presentation Nautilus, which was the original wooden Nautilus model Disney used to promote the film (Estimate: $20,000-$30,000). 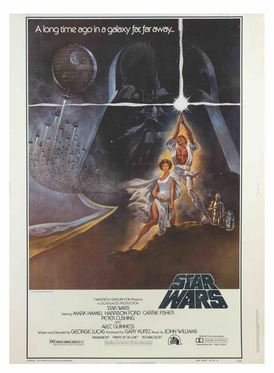 Pop culture moments from film and television are also highlighted with items including a “Star Wars” (Lucas Films, 1997) cast and crew signed poster (Estimate: $2,000-$3,000); a Peter Ellenshaw “The Black Hole” (Disney, 1979) original concept drawing (Estimate $1,000-$2,000); “Back to the Future Part III” (Universal, 1990) original artwork by legendary poster artist Drew Struzan (Estimate: $20,000-$30,000); a “Men in Black” (Columbia, 1991) Neutralizer prop (Estimate: $2,000-$3,000); a “Mary Poppins” original chimney sweep concept painting (Estimate $8,000-$10,000); a Madonna uniform from “A League of Their Own” (Estimate: $3,000-$5,000); original “Willy Wonka” (Paramount, 1967) candy room concept art (Estimate: $5,000-$7,000); a Bally “Tommy” (Bally, 1975) Pinball Wizard machine (Estimate: $2,000-$3,000); “The Simpsons” original cel and matching background from the first episode (Estimate: $1,500-$2,500) and an original John Alvin “Pocahontas” poster concept (Estimate: $1,000-$2,000). The collection is too vast and covers too many eras of television and film to provide a complete list of items offered at this auction, but it includes art from “Star Trek,” “E.T. the Extra-Terrestrial,” “Escape from Alcatraz,” “Raiders of the Lost Ark,” ‘Planet of the Apes,” “Jaws,” and so much more. Other highlights include The Beatles’ “Yellow Submarine” (King Features, 1968) animation cels (Estimate: $2,000-$3,000); vintage Marx toy displays (Estimate: $2,500-$3,500), and hundreds of remarkable Disneyland artifacts and art. Some notable Disneyland highlights include an original hand-silkscreened 1956 Disneyland Hotel attraction poster (Estimate: $5,000-$7,000); a complete set of 6 near-attraction posters from 1966 (Estimate: $3,500-$4,500); a 1955 “Jungle Cruise” prop Impala ear display (Estimate: $1,500-$2,500); an original Mark Twain and Keel Boats 1955 attraction poster (Estimate: $6,000-$8,000); a “Big Thunder Mountain” 1980 brownline (Estimate: $400-$600); an extremely rare “Pirates of the Caribbean” original painting (Estimate: $3,000-$5,000); a “Fantasmic” crocodile model by Kevin Kidney (Estimate: $2,000-$4,000); an original 1955 “Fantasyland” attraction poster (Estimate: $6,000-$8,000); an original 1959 Paul Hartley “Matterhorn Bobsleds” attraction poster (Estimate: $6,000-$8,000); the 1967 “Adventure Thru Inner Space” Atommobile prop (Estimate: $6,000-$8,000), and so much more. “The Art of Entertainment” auction covers decades beginning in the late 1930s through today. The extraordinary selection has taken years to amass by collectors around the globe and pop culture enthusiasts. Van Eaton Galleries will conduct the one-day auction on-site, online, and by phone. Interested bidders are encouraged to register early. Media interested in covering is requested to email or call the press contact listed below.